Bilingual pocket chart encourages students to help out around the classroom. 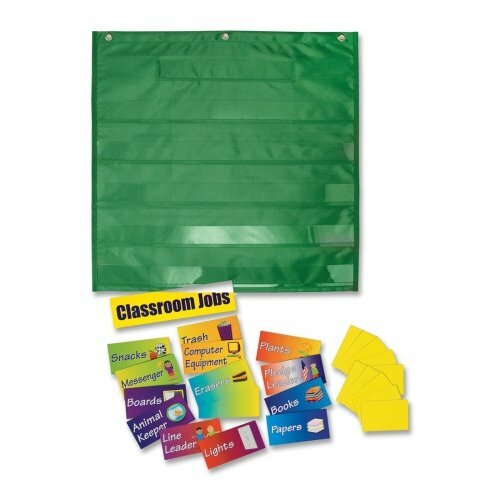 Pockets let you match of cards with preprinted classroom jobs and handwritten name cards. Design allows students to learn responsibility while helping the teacher with classroom management. All cards including 10 name cards are dry-erase so they can be reused. Jobs included: Erasers, Trash, Line Leader, Lights, Boards, Animal Keeper, Books, Messenger, Computer Equipment, Papers, Plants, Pledge Leader, Snacks and one blank card for a unique job. Cards feature English with Spanish translations on the back.